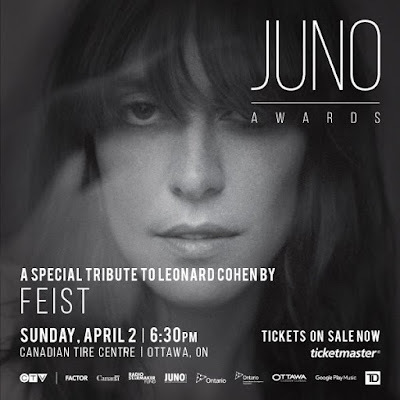 Award winning musical artist Feist will perform at the JUNOs to honour the late, great Canadian musician, Companion of the Order of Canada and member of the Canadian Music Hall of Fame - Leonard Cohen. 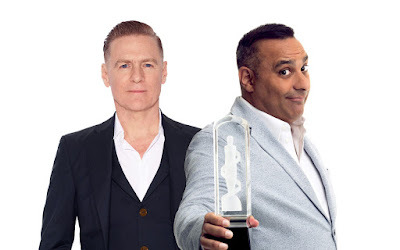 The JUNOs are in Ottawa this year on Sunday, April 2nd and are presented by CTV and the Canadian Academy of Recording Arts and Sciences (CARAS). "More than 2,000 recordings of Leonard Cohen’s songs have been made by artists that range from Elton John, U2, Jeff Buckley, to Aretha Franklin. And from Bob Dylan to Justin Timberlake, more than 200 artists have sung or recorded the now iconic “Hallelujah” since Cohen’s original recording in 1984, including breathtaking performances by k.d. lang at THE 2005 JUNO AWARDS in Winnipeg, and the Opening Ceremonies of the Vancouver 2010 Winter Olympics Games." The 46th annual awards show will be co-hosted by rocker Bryan Adams and comedian Russell Peters. Photo above, provided. "This year’s lineup of presenters and performers were also announced today and include: electronic duo Bob Moses; music pioneer and 2017 Allan Waters Humanitarian Award recipient Buffy Sainte-Marie; singer-songwriter and JUNO Award nominee Chantal Kreviazuk; singer, songwriter and producer Coleman Hell; singer-songwriter Delaney Jane; rapper Jazz Cartier; platinum-selling country artist Jess Moskaluke; Blue Rodeo’s Jim Cuddy; comedian and Much Digital Studios Creator Jus Reign; Marianas Trench frontman Josh Ramsay; ETALK reporter Liz Trinnear; the Minister of Canadian Heritage, the Honourable Mélanie Joly; Nathan Dales and Michelle Mylett from CraveTV’s LETTERKENNY, rockers Sam Roberts Band; Arkells, A Tribe Called Red, Alessia Cara, Billy Talent, Dallas Smith, July Talk, Ruth B, Sarah McLachlan, Shawn Mendes, and The Strumbellas and Toronto rap artist Tasha the Amazon." JUNOTV.ca will also feature live backstage access through the new Samsung Red Carpet Live Stream in 360 with 3 cameras along the carpet. The online show will include backstage views, interviews, celebrity events and of course the red carpet arrivals. With the assistance of the Ontario Media Development Corporation (OMDC) JUNO TV will also show the Gala Dinner and Awards presentations, hosted by Sam Sutherland and Lana Gay, which livestreams 6pm ET on Saturday, April 1. You can also find additional JUNO exclusive content on facebook. 6:30pm ET - JUNO TV Backstage Lounge at The JUNOS co-hosted by Sam Sutherland and Lana Gay where winners, performers, presenters and more stop by for a chat!